Wow, I just noticed that I haven't posted in a year. So much for being diligent and posting regularly. I really should make that a New Years Resolution, and then stick to it. In my own defense, I haven't just been sitting around eating bonbons, I have actually been quite busy. So let's see what I've accomplished since I last posted. I'll start back at last May and work my way to the present. Trust me, it'll be worth the read. The semicolon is a symbol for the mental health awareness campaign, Project Semicolon, to draw awareness and support for those dealing with mental illness, depression, or the loss of someone from suicide. As someone who has problems with depression, this is very relevant for me. "Pause" is 24" x 34". The background is made of various light strips in white, cream, and light blue. 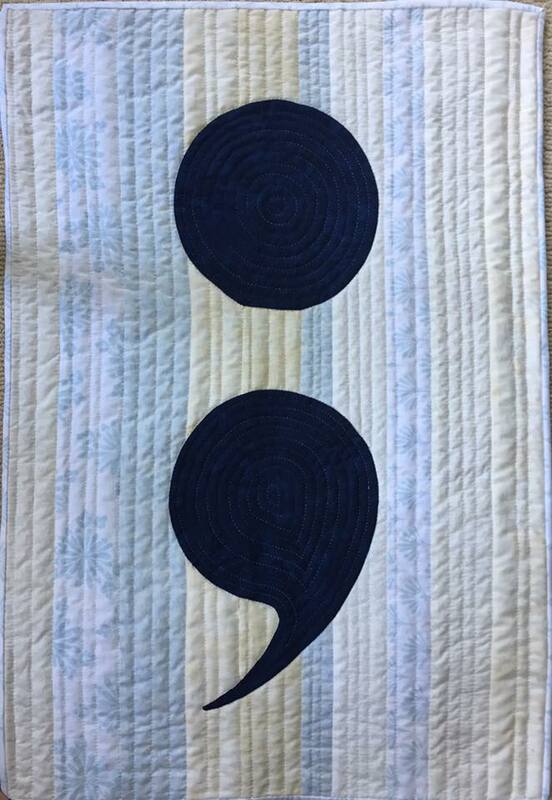 The semicolon is a mottled navy. 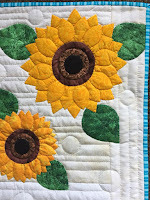 It is, of course, hand appliqued and hand quilted (do I really need to say that anymore? they ALL are). 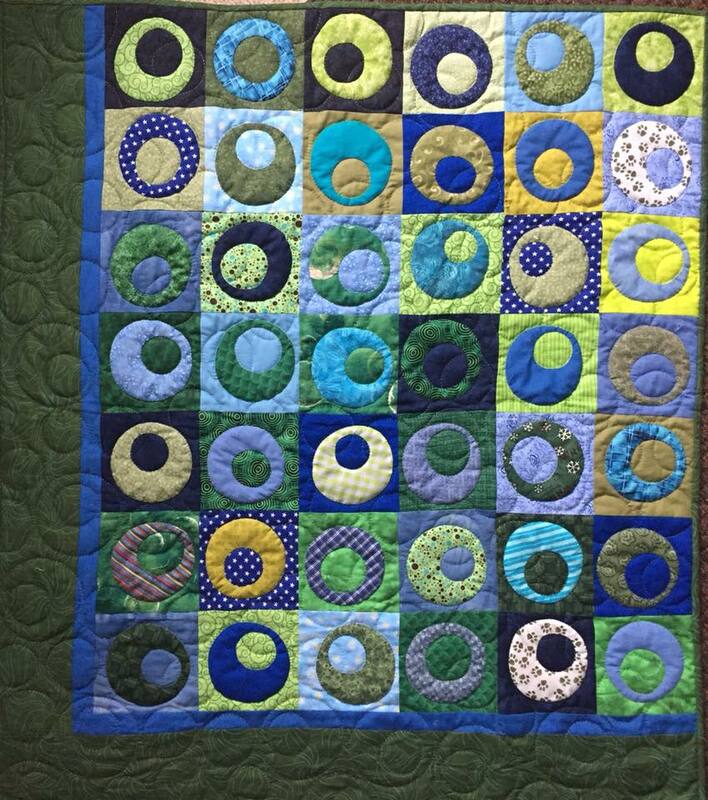 I quilted random width vertical lines in the background and radiating circles inside the semicolon. I get a lot of ideas from wall art I see in home decorating stores, I think that's where I got the idea for this one. It's pretty basic, with cream and blue wide horizontal background strips and a sparkly moon with the words appliqued on top. I just ditch quilted around the words and the moon, random stars in the background. "To the Moon" is 20" x 34". I like horses. I think they're beautiful, graceful creatures. I'm deathly allergic to them, but I like them from afar. 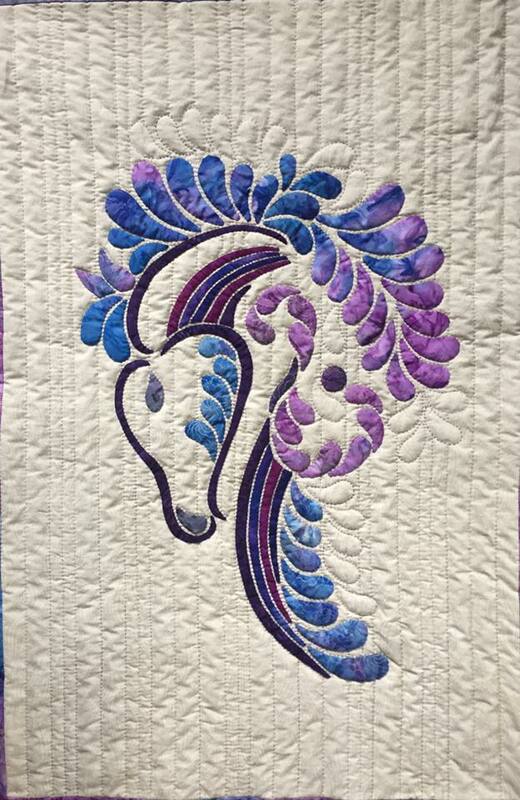 I had been wanting to make a horse quilt for a while, but didn't want to make one that looked like it was trying to be too realistic. Then when I came across this blue and purple batik I knew exactly what it was for. I used different dark solids for the outline of the horse, but the feathers are all from the same fabric. It's 21½" x 32"
I've done a bunch of name banners for nieces and nephews over the years, but recently I've been more into just doing the initial. A friend saw the lower case g I made for myself (for Gray) and asked if I could do a D for her sister's birthday. 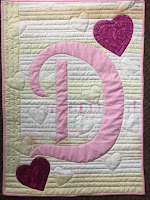 So "D" is 21" x 28½", in a sparkly pink on a light background and a couple of dark pink hearts. 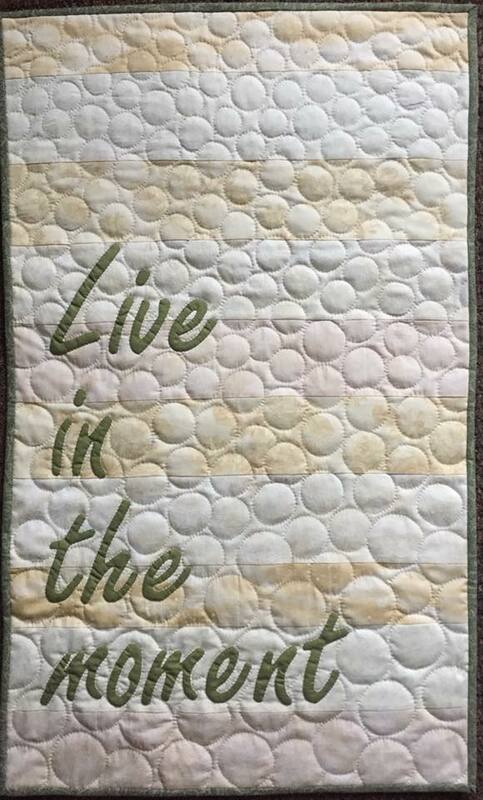 I quilted it with variegated pastel thread. This is another one that was inspired by something I saw on tv or in a decorating store. It is also a learning experience. "Live in the Moment" is 20" x 34". I love the sage green lettering, though it doesn't show up great on the darker beige strips in the background. Also, I loved the idea of quilting bubbles in the background, going from larger on bottom to smaller at the top. That was such a pain in the neck to do! And I don't think I did a wide enough variation between the large and small. Note to self: don't do that again. 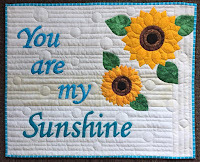 "You are my Sunshine" is 28" x 22". The sunflower petals are all individually appliqued, made from a lovely bright yellow batik. I love the look of batik, especially all the variation in the marbling of the pattern, but it's a real b**** to quilt through. My fingers always need a break after something like this. I do like how the layered petals turned out though. 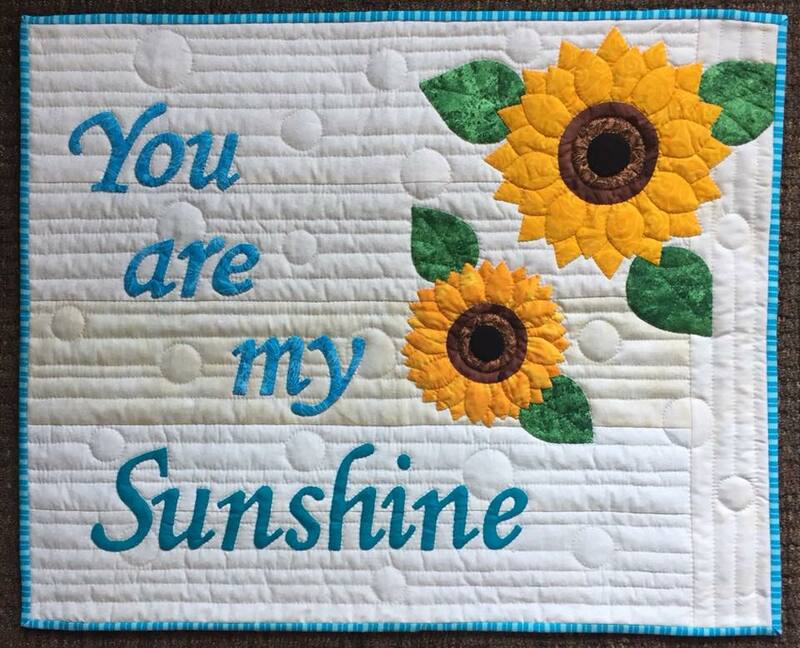 I'd been trying to come up with another original pattern to put out there, then when my cousin's girl had a baby I got a brainstorm for a baby quilt. Of course it's circles, they're one of my favourite things to do. Blues and greens (also my fav) for a boy. 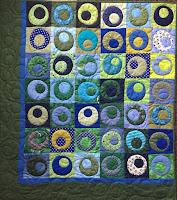 I quilted circles into the background with variegated blue thread. It's called "O Baby". I've got a lighter colour version in the works now, then I'll do a pink one as I work on the pattern instructions.